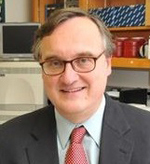 Gabor J. Tigyi, M.D., Ph.D.
Dr. Tigyi is Professor and Harriett Van Vleet Endowed Chair of the Department of Physiology at the University of Tennessee Health Science Center Memphis. Dr. Tigyi's primary career interest concerns to physiological and pathophysiological role of lysophospholipid mediators. Since 1987, when he discovered lysophosphatidic acid (LPA) as a bioactive serum factor, his research focuses on the isolation, biochemical structure elucidation, molecular target identification and cellular signaling of LPA and sphingosine-1-phosphate (S1P). His group has identified sphingosylphosphorylcholine, cyclic phosphatidic acid, and alkenyl glycerophosphate as novel members of the growth factor-like lysophospholipid family. Since the mid-nineties, they have been elucidating the molecular pharmacology of lysophospholipid targets, developed and applied computational chemical methods for drug discovery. This work yielded several patents and a rationally designed LPA mimetics, octadecenyl thiophosphate (OTP/Rx100) that is currently being tested in non-human primates and has entered the FDA approval process on the fats track for the treatment of radiation injury. He has trained many fellows and postdocs who have successfully transitioned into faculty positions in the US, Europe (Hungary, Germany, UK) and Japan. They have successfully applied high-throughput and in silico screening methods to identify nonlipid agonists of LPA receptor subtype 2, which are very effective promoters of cell survival. His group has been studying the mechanisms of radiation injury to the gut since 1997 and has elucidated several signaling pathways involved in the mitigation of radiation injury. They have used computational and high-throughput screening methods to develop several lead compounds, which inhibit LPA production through blocking lysophospholipase D/autotaxin, also LPA and S1P receptor antagonist, which inhibit cancer growth and metastasis in vivo. Dr. Tigyi is External Member of the Hungarian Academy of Sciences and the European Academy of Arts, Letters and Sciences in Paris.